Amatic Industries is what we call a ‘golden oldie’. They’ve been around for more than 20 years and date back all the way to 1993. The knowledge and expertise they’ve gained through that time is one of a kind and they’re known for de development and production of top-notch games, software, cabinets, multiplayer systems and server-based video lottery terminals. Most experienced casino lovers will recognize some of their cabinets as they can be found in land-based casino’s all over the world. As we said before the roots of Amatic existed before online gaming became the popular phenomenon it is today. Back when lovers of casinos had to actually get out of the house and drive to the nearest casino to enjoy the creations of Amatic. It is because they started before the internet era that they have managed to expand their knowledge so well and fine-tuned their skill when it comes to creating and producing land-based games. The quality that Amatic Industries delivers does not go unnoticed, and was even rewarded last year when they won the “Gold Dice 2015” award. The company offers multiple Jackpot solutions from “Stand Alone”-Jackpots, which are only connected to a few machines, to mega jackpots of wide areas. The most popular Jackpot solutions of the moment are the AMATIC 3- and 4 level solution as they are installed very often. As we’re used to from Jackpot solutions the amount that can be won increases with every single bet that is made. If a player wins the jackpot they’ll see a short animation after which the amount is added to the balance of the game being played. Understanding that there are loads of players who prefer to play from the comfort of their own home, Amatic Industries had decided to take on a new target group whilst maintaining the quality that we’re use to. Instead of trying to reinvent the wheel they’ve been wise to stick to what they’ve already mastered and created a whole range of online versions of their popular land-based games. Their online branche has been named AMANET, which has a customizable online gaming platform as latest addition to their product portfolio. Besides a range of video slots, AMANET also offers players poker, roulette and blackjack and are constantly on the lookout for new and innovative games to add to their ever growing list. The land-based casino feel is transferred online, making you feel as if you’ve entered a real casino without leaving the sofa. The online games are implemented to HTML5, meaning that the games are accessible and adapt to all devices, including tablets and mobile phones. Besides the creation of land-based and online games the company keeps busy by creating all sorts of systems and solutions. First of all they offer a powerful back office solution which allows casinos to get to know their players and manage their content. It offers the possibility to monitor the performance of the games as well as facilitate customer service. It’s also possible for businesses to start their own stand-alone Online casino from scratch with the help of AMATIC’s turnkey solution, which includes game content integration, full web-development and back office management. Amatic Industries will be exhibiting at the SAGSE ARGENTINA between November 15th and 17th located in Buenos Aires. 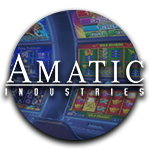 We expect that Amatic will continue to produce and distribute top-notch cabinets and games as well as releasing the online versions of them in the future.